Haiku’s source code is currently being hosted in a Git based repository. Anonymous access will allow anyone to download Haiku’s source code; However, only Haiku contributors with commit access should use the authenticated (non-anonymous) method. Configure your git! Before making any commits to the Haiku repository (local even), be sure to configure the git environment on your local system! Failure to configure git properly before a commit will result in incorrect naming in your commit and public humiliation on the mailing list. The buildtools are not needed when building from within Haiku. Pre-built images of Haiku already come with the buildtools pre-installed. If you don’t care about the commit history and want to keep the download small, try using the parameter --depth when cloning. --depth 10 limits the history to the last 10 commits, for example. Before making your first commit on a new system, be sure to configure Git. These global settings are stored in your git configuration directory (~/.git/ or for Haiku: ~config/settings/git/) and will be appended to each commit as your personal information. git config --global user.email "john.doe@developers.com"
git config --global alias.st "status -s"
The <login>@ is only needed if your currently logged in username doesn’t match your git.haiku-os.org username. Haiku’s source code needs to reside on a case sensitive file system. In short, such a file system recognizes “ThisIsAFile.txt” and “THISISAFILE.txt” as two different files. Some file systems that are (or could be) case in-sensitive include, FAT32, NTFS, and HFS+. Mac OS X’s HFS+ is case in-sensitive by default. For more information regarding how to create a case-sensitive HFS+ volume, see this article. Haiku’s main Git repository does not allow HTTP access, which is a problem if you are accessing the Internet through a proxy server that only permits HTTP (port 80) traffic. Note however that these repositories do not contain any hrev tags, which are used by the Haiku build system to determine the Haiku revision. To work around this limitation, use the HAIKU_REVISION build variable when building Haiku. 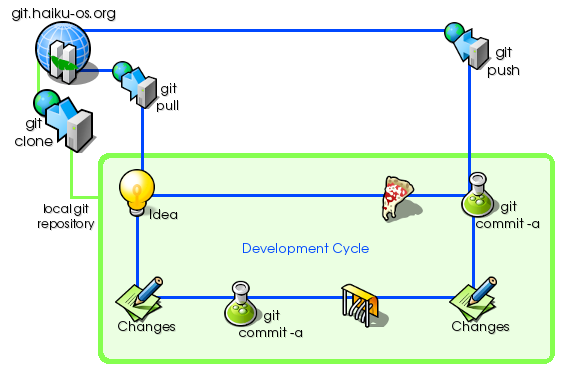 Alternatively, a single path or multiple paths can be given to git pull. This will allow you to run the following command from any directory. This becomes extremely useful if you use an external object directory or if you wish to update both the buildtools and haiku directories at the same time. In git you make commits to your local tree, then push the final results to the central remote Haiku repository. The comment quality of commits should be high, explaining changes in as much detail as possible. Short commit messages are best utilized for small changes or changes that hold a simple ideal. git commit -a -m "WebPositive: Style cleanup, no functional change"
Long commit messages are best used to explain what was changed and why on new code, rewrites, or other tasks that may need explanation. * Ensure cats in computer are fed. * Clean up white space. The first line should be a summary no longer than 64 characters, separated from a detailed description by a blank line. The description lines shouldn’t be longer than 72 characters. After your changes are complete, the push command will push your local tree to the remote Haiku repository.